Step 1: The candidates need to visit the College Official Website. Step 2: The candidates can apply in this Institution in two ways; Online or Offline. Step 3: For the Online Application Process, the candidates will get the Online Application Form from the Official Website of college. 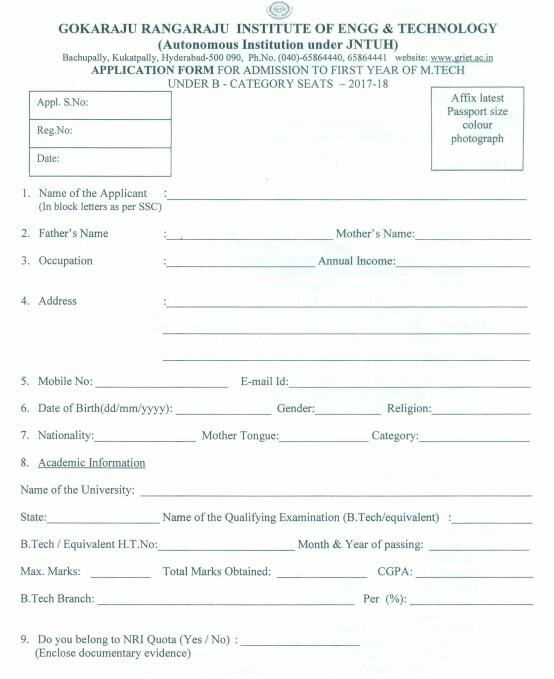 Step 4: The candidates also can download the Offline Application Form from the Official Website. Step 6: For Online Application Process, the candidates have to pay the registration fee of Rs. 5000/- via online (Credit Card/ Debit Card/ Net Banking). Shortlisted candidates on the basis of marked scored in entrance examination will be called for the counseling process via e-mail for Gokaraju Rangaraju Institute of Engineering and Technology, Hyderabad admission. The candidates have to be present at the Institute for the counseling on the particular date. No extra date will be provided for the counseling process. The candidates have to carry all the original mark sheets, certificates, ID proof, passport size photo at the time of counseling. After the counseling process, the candidates are requested to book their respective seats. 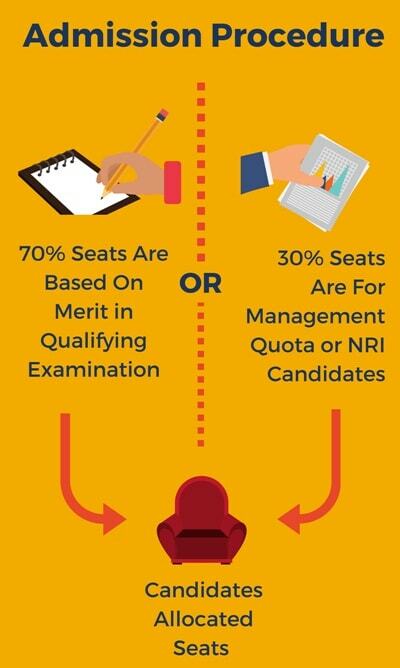 70% of the seats are allotted based on the merit in the entrance exams like TS EAMCET, GATE, TS PGECET and rest 30% of the seats are earmarked for the Management Quota and NRI students. Under lateral entry scheme, 20% of intake is based on the merit in the ECET and Diploma holders are admitted in second year of B.Tech. Gokaraju Rangaraju Institute of Engineering and Technology admission 2019 are made through the Telangana State Common Entrance Test (TS EAMCET), conducted by the Government of Telangana State. The minimum qualification for the admission to the first year of B.Tech course is a pass in the Intermediate (10+2) conducted by the Board of Intermediate Education, Government of Telangana State or any other recognized board with Mathematics, Physics, and Chemistry as main subjects. To get into GRIET, sponsored Candidates must have a BE / B.Tech Degree or its equivalent degree from any AICTE approved Institution with a minimum of 55% marks in aggregate. Non-Sponsored Candidates must have a BE / B.Tech Degree or its equivalent degree from any AICTE approved Institution and a valid GATE 2019 Score / TS PGECET Rank. The candidates must have a minimum two years of full-time work experience in a recognized Firm/ Industry/ Company/ Educational or Research Institution/ Any Department of Government/ Autonomous organization in the relevant field in which admission is being sought. To get an admission at Gokaraju Rangaraju Institute of Engineering and Technology, the student must score a good rank in EAMCET. EAMCET entrance examination has to be written to get a seat allotted in GRIET. The typical cutoff of my course ECE is to have a rank below 10000. The eligibility criteria for joining Gokaraju Rangaraju Institute of Engineering and Technology is clearing the PGCET exam. EAMCET is the entrance exam for counselling quota. I appeared in TS EAMCET for the admission and the cut-off mark was 80 out of 200 for the admission at GRIET. AP EAMCET is the entrance exam to get the admission in this college. The cutoff is around 106 out of 180. A student(general) should achieve below 6,000 of ranks in the AP EAMCET entrance exam to get enrolled there. The eligibility criteria for the admission at my college is TS EAMCET with the qualifying percentage. No idea about entrance exam, because I got the admission through management quota. TS EAMCET is the entrance exam to get the admission in this college. The entrance exam for this college is AP EAMCET. The entrance exam for this college is EAMCET. The enteance exam for this college EAMCET. The entrance exam is EAMCET. The candidates who want to seek admission in GRIET have to qualify in the EAMCET ( Engineering ,Agricultural and Medical Common Entrance Test ) examination conducted by Govt. of Telangana . To be eligible for appearing in the EAMCET examination, the student should have passed the 10 + 2 with Maths,Physics and Chemistry as their main stream. The candidates should attend the counselling for admission into the Engineering colleges conducted by the Convenor. Based on the rank obtained in EAMCET, candidates can opt for GRIET as per the availability of the college and branch at the time of counselling. Admission will be made through GATE. 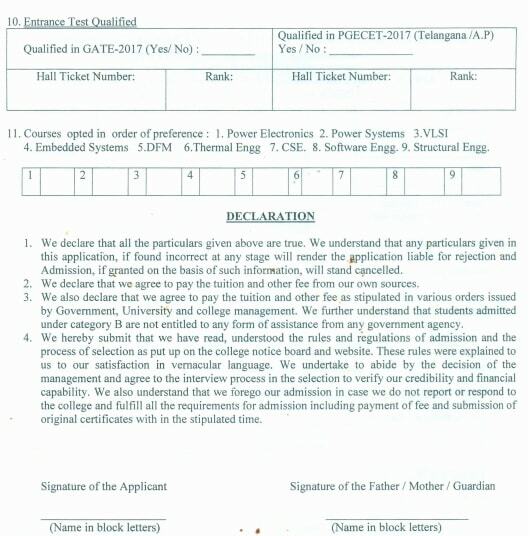 When GATE Candidates are not available, admission will be given to PGECET qualified candidates on merit basis. Admission for Sponsored category will be made based on merit. Preference will be given to GATE qualified candidates. The candidates who wish to seek admission in GRIET B Tech Programmes have to qualify in the EAMCET (Engineering, Agricultural and Medical Common Entrance Test ) examination conducted by the State Government. To be eligible for appearing in the EAMCET examination, the student should have passed the 10 + 2 with Maths, Physics and Chemistry as their main stream for all Pragrammes*. 50% of the seats in B Tech (Bio Technology) are reserved for candidates who have passed +2 Exam in BiPC/ MBiPC (CBSE/Other) stream. Pass in +2 Exam with 50% or equivalent. Pass in Bridge Course Maths – I & Maths – II conducted by BIE, AP, Hyderabad. The candidates seeking admission through counselling should follow the procedure as announced by the convenor.